My primary boat is a custom one of a kind Proline 24 Bay that I designed and specially built for my chartering business right here in Homosassa. It handles the shallow flats and offshore seas with ease and it's an extremely comfortable dry ride. It's powered by a the finest - a 225 Mercury Optimax Saltwater series engine. I can comfortably seat up to four anglers and it's truly one of the most versatile boats on the water. Garmin marine electronics, Icom VHF radio, Sony stereo, Power Pole "shallow water anchor", Minn-Kota trolling motor and G-Loomis rods and Shimano reels; you'll have the best equimpent possible for a memorable day on the water. 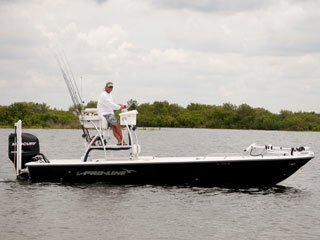 My Silver King 16 signature is a legendary skiff and "the" tarpon skiff for fishing the Crystal River/Homosassa area. I have it custom rigged with dual 109 lb thrust 36 volt trolling motors, elevated casting platform and powered by the finest - a 115 Pro XS Mercury Optimax. Whether your after the mighty tarpon or would like to sight fish red fish and trout in the back country, this skiff delivers.